The Lit and Phil’s first woman President, Agnes Archer Evans, had one of the most remarkable lives of any President of the Society. She was born in the island of Van Dieman’s Land off the southern coast of the Australian mainland (renamed Tasmania in 1856) on the estate of her maternal grandfather, Thomas Archer (1790 – 1850). Born in Hertfordshire, Archer went to Sydney, New South Wales, as an Assistant Commissary in 1812 and became Commissary to the growing convict settlements in Van Dieman’s Land the following year, when he was joined by his father and two of his brothers. All three brothers soon obtained land grants from the colonial authorities of Free Settler Estates in the north-east of the island and, mainly using convict labour, quickly established three substantial agricultural estates on the land they cleared, with a special emphasis on the production of merino wool for export to England. The three brothers developed a completely new town, Longford, at the centre of their properties, and six or more generations later the Archer family are still prominent landowners and farmers in the area. The father of Agnes Evans was a Scottish physician, Dr. John Stewart Kilgour (1815 – 1902), who was working as a medical officer on the island when he married Susan Anne, a daughter of Thomas Archer. Agnes was their first child, born in her grandfather’s mansion, “Woolmers” in 1848, now an Australian National Historic Monument, which was in turn inscribed by UNESCO on the World Heritage List in July 2010. Three other children of the family were also born in Longford, Van Dieman’s Land, (including Mary Stewart Kilgour, 1851 – 1955, who was to become a nationally famous figure in women’s higher education), before the family returned to Britain, living for relatively short periods in in Worcester, London, Exmouth, Devon, and the Isle of Man before settling in Cheltenham in around 1860. By this time the family numbered eight children, and a further five were to be born in Cheltenham. However, in 1882 she was joined at Belmont House by her old friend from Chelteham days, Agnes Kilgour, as both a teacher and, apparently, with a view to her taking over the School from Anna Beale, who was in poor health. The period of Anna Beale and Agnes Kilgour was regarded as outstanding in developing the education of girls in Leicester, and by 1886 Agnes Kilgour was listed in the local directory as the Head and proprietor. However, the following year she returned to Cheltenham Ladies’ College and taught their full-time as a Class Teacher and specialist in History through to July 1895 (serving also as Head of the Second Year from September 1890). Belmont House School, meanwhile, passed through three headships (and presumably ownerships) in quick succession before becoming the Leicester and county College of Music under Herr. W. Richter sometime between 1892 and 1894. In July 1895 Agnes left the College and married in Cheltenham a prosperous Leicester corn miller, William Evans (1830 – 1921), whose first wife, Isabella Evans (1837 – 1894, daughter of the well-known Leicester urban missionary Joseph Dare) had died the previous year, living with Evans in his house at 6 St. Martin’s, Leicester, almost opposite what is now Leicester Cathedral, together with two step-children, including William A. Evans, who was to be her immediate successor as President of the Lit and Phil (for 1914 – 1915). No. 6 St Martin’s now bears a Blue Plaque recording her residence there. 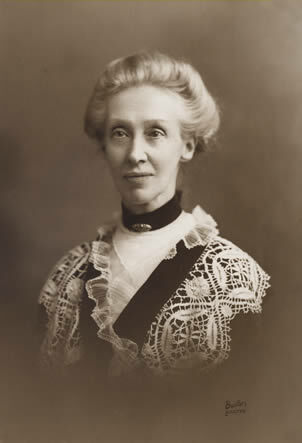 Though she did not return to teaching Agnes Archer Evans made very considerable contributions to many areas of Leicester life, including the serving on the Leicester School Board, the Councils of Vaughan College and then also of the University College when this was established, and work with the Womens’ Suffrage Movement. William Evans had joined the Lit and Phil in 1894 and would no doubt have quickly introduced her to the Society after their marriage. On the death of her husband in 1921 Agnes Evans moved back to Cheltenham, where she died in three years later. Sources include: Neil Chick: The Archers of Van Dieman’s Land: a history of pioneer pastoral families (Lenah Valley, Tasmania, 1991); World Heritage Committee: Woolmers, Longford, Tasmania: Management Plan (UNESCO Paris, 2010); Shirley Aucott: Women of Courage, Vision and Talent: Lives in Leicester 1780 – 1925 (Leicester, 2008); Cheltenham Ladies’ College Archives: Staff Records Book 1875 – 1915 (courtesy Miss Isobel Laing of the College Archives); Elaine Kaye: Mary Stewart Kilgour (1851 – 1955) (Oxford Dictionary of National Biography, 2004); England and Wales Censuses 1841 to 1911 inclusive; England and Wales Births, Marriages and Deaths Registrations; Leicester & Leicestershire Directories 1875 to 1894.